Howlin' Wolf Records: SIX STRINGS: BEST WORST MOVIE is simply THE BEST! 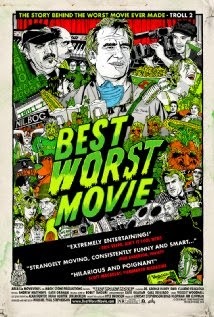 BEST WORST MOVIE is the best documentary I have ever seen. It deals with the concept of what gives a film its "cult" status. The documentary explores the weird fascination some people have for the movie TROLL 2. The kid from TROLL 2, Michael Stephenson is all grown up and has become a film maker himself. He takes us on a little journey learning just how much people truly love TROLL 2. The film TROLL 2 has experienced a surge in popularity in the last few years. Troll 2? I remember the first one unfortunately, but never saw beyond that. The sequel has nothing to do with the original. In fact the sequel doesn't even have trolls in it!